Congratulations to PhD student Wenyi Ling, who was selected to receive a 2018 LLL Award for Excellence in Doctoral Dissertation Research. 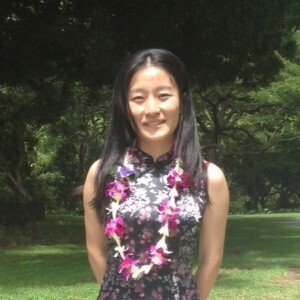 Wenyi will be a featured speaker at the 22nd Annual Graduate Student Conference, College of Languages, Linguistics & Literature, UHM. Wenyi is writing her dissertation about perceiving, processing, and learning Mandarin language tone by second language speakers. Currently, Wenyi is analyzing eye-tracking data from a research study she designed on using tonal information to recognize Mandarin words. Ultimately, she wants to create useful learning and teaching materials on the subject. Recent studies using more temporally sensitive methods (eye-tracking, ERPs) point towards very early use of both tonal and segmental information in spoken word recognition by native speakers (NS) (Malins & Joanisse, 2010, 2012; Zhao et al., 2011). However, second language (L2) learners, whose native languages are non-tonal, may differ from NSs in the relative weighting of segmental vs. tonal information in spoken word recognition due to their long-term language experiences (Pelzl et al., 2015). This experiment investigates if the hypothesized difference between NSs and L2 learners in the relative roles of tonal vs. segmental information was reflected in their incremental processing of spoken words in Mandarin by using eye-tracking. Participants listened to questions (qing3xun3+ target ‘please choose…’), while viewing scenes containing a referred target (e.g., gǒu, ‘dog’), competitor and distractor. Competitors differed by the overlap of segmental and tonal information in three conditions, representing either a segmental competitor (SC: gou1 ‘hook’), which completely matches the target in segmental content but differs in tone; a rhyme competitor (RC: shou3 ‘hand’), which matches the target in segmental and tonal content of the rhyme but differs in onset; a vowel competitor (VC: dou4 ‘bean’), which matches the target in segmental but not tonal content of the rhyme and also differs in onset. In the L1 group, all three conditions showed no competition between fixation to target and competitors, indicating concurrent processing of tonal and segmental information. In the L2 group, competition between targets and competitors was found in SC condition, but not in RC or VC conditions, suggesting tones are relative less informative. These patterns (supported by mixed-effect regression models) provide further evidence of less reliance on tonal information in L2 vs. L1 word processing.